I ♥ Motherhood: Ice Age: A Mammoth Christmas - Christmas Stocking Filler! Ice Age: A Mammoth Christmas - Christmas Stocking Filler! Last week I was lucky enough to be invited to a preview lunch for the new Ice Age DVD release - A Mammoth Christmas. In recognition of the fact it's a Christmas release we had a delicious 3 course Christmas lunch and pulled crackers while Christmas Carols played in the background! It really was a lovely way to spend a lunchtime, I appreciated some me time away from the kids and also caught up with Mirka from All Baby Advice looking glowing with baby bump! So after the festive fun we went to the screening room and watched the 20 minute film. So what's it all about? Everyone's favourite sub-zero heroes are back in an all-new holiday adventure for the whole family. When Sid accidentally destroys Manny's heirloom Christmas rock and ends up on Santa's "naughty list", he leads a hilarious quest to the North Pole to make things right - and ends up making things much worse. Now it's up to Manny and his pre-historic posse to band together and save Christmas for the entire world. I can't wait for Isla to see it as she really loves the characters in Ice Age (she should do after the number of times we've watched it together!) and she loves the little squirrel who chases the acorn all the time. I enjoyed it, it was very funny and all the original voice cast are back too. 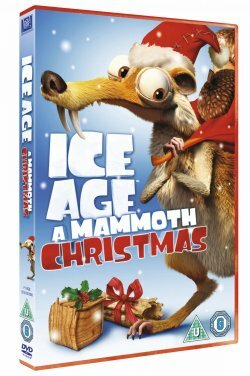 Ice-Age: A Mammoth Christmas is out on DVD from the 21st November 2011and is available exclusively from Asda, courtesy of Twentieth Century Fox Home Entertainment. Priced at an excellent £5! I was given a box set of the Ice Age collection and a cuddly squirrel on the day. The views written here are my own. That looks great! I am definitely going to get it!